Lot of people connected to me look interested to the topic, here I decided to create a short tutorial on how download and build the kernel for aarch64 platform, make it run on QEMU (see previous article) and finally, navigate it in Eclipse, or edit it up to debugging the running kernel via GDB or in Eclipse through the IDE. Yeahh, I know, I real kernel developer uses Vim or Emacs to play with the kernel code; unfortunately I am not a kernel developer, don't blame me! Here the goal is not to write kernel code but to understand what happens, read the code with the help of Eclipse indexing and if you are brave, debug it! 1) need a proper toolchain for aarch64 installed (check ubuntu development essential for aarch64 package or just get what you need via single hit apt-get install). Ubuntu 14.04 has a repo with a good Linaro aarch64 toolchain 4.8 which works great! 2) optionally, get NDK from Google. The version 4.9 supports aarch64. 4) Optionally, if you don't like the Eclipse base Cross GCC plugin, I would recommend to get ARM Cross GCC which ships magically with a Linaro aarch64-linu-gnu- predefined toolchain and is a lot less work in configuration and pain getting compiler macros. With the release of lollipop Android L, few things have changes. First emulator64-arm64 is not included in the AOSP any more, it's a project on its own. As soon as a dedicated team of engineer will perform proper testing, one day or another expect to see it back. For the time being, it's kept in a different source repo. Second the build for arm64 is kind of screwed on AOSP 5.0 r2. The vendorsetup for a full aosp 64 bit ranchu is not there, but funny enough the make script is! 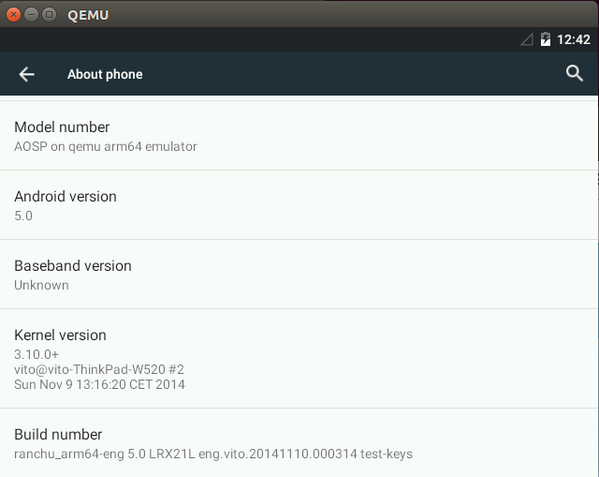 Another good useful point is the mini_emulator which allows to have a running shell only mini version of android running on qemu. If your goal is to work with low level os stuff, this is your way. so I fixed the files, you need also to include proper init.rc for ranchu, fstab and other bits. this file contains my fixed scripts. wait... you'll get out/products/mini-emulator-arm64 with *.img files to run the emulator like described in my previous article, it works! The Linaro team put together ahead of time, around may 2014, a version of the Kernel for aarch64 called ranchu (forked from 3.10) and patched/worked together with the qemu team to create a machine model ranchu capable of emulating aarch64. Everything is well explained in the article above. However, by compiling the latest Android L preview 2 AOSP, I ended up with serious issues during the zygote startup. It looks there is something seriously different in how boot.art is made, thus passing it to patchoat (at first time boot) something goes very wrong. Not going into details of the hell issue. Sometimes, when things goes wrong, better to restart from scratch. It's the old rule learned since the old Windows 95 time, hit ctrl-alt-delete. note: you need repo command from google configured on your system. 4) to run the emulator you need anyhow an AVD configuration or start it manually from the qemu binary without using the google emulator wrapper. I prefer to use the wrapper here as the command is cleaner. or if you have already defined AVDs, just use one of them, settings will be overwritten by the command, so whatever you have in your AVD you are just using the config.ini file (stored in the .android folder). Preferably, set your AVD with more then 1024 MB ram. 5) now you are ready to launch the emulator, here is the command (all one line). testL is the name of the AVD prepared. Wait, wait wait for android to finish booting, remember you are on a slow emulation, it takes time. If you are curios to see what's going on, just run "logcat" at the prompt to see all the mess in real time. debug: skip boot console de-registration. GIC CPU mask not found - kernel will fail to boot. Architected local timer running at 62.50MHz (virt). SMP: Total of 1 processors activated (125.00 BogoMIPS). hw-breakpoint: found 6 breakpoint and 4 watchpoint registers. init (1): /proc/1/oom_adj is deprecated, please use /proc/1/oom_score_adj instead. Independently manteined by Vito Rallo . Simple theme. Powered by Blogger.